So it’s a bit past ten and I’m sitting at the computer downstairs, blog-hopping the night away. It’s a cold night. And suddenly, Dog-a-doodle gets up from her nearby chair, where she had been sleeping for awhile, and goes upstairs. And I watch her climb the stairs and disappear out of view. I know where she went. She went to my room to sleep. On her own. And I’m still here downstairs! Now I know I may be babbling here, but that just isn’t right!! Aren’t dogs supposed to be up all night guarding the house? And barking at random noises? Heck most dogs do all that outside the house! 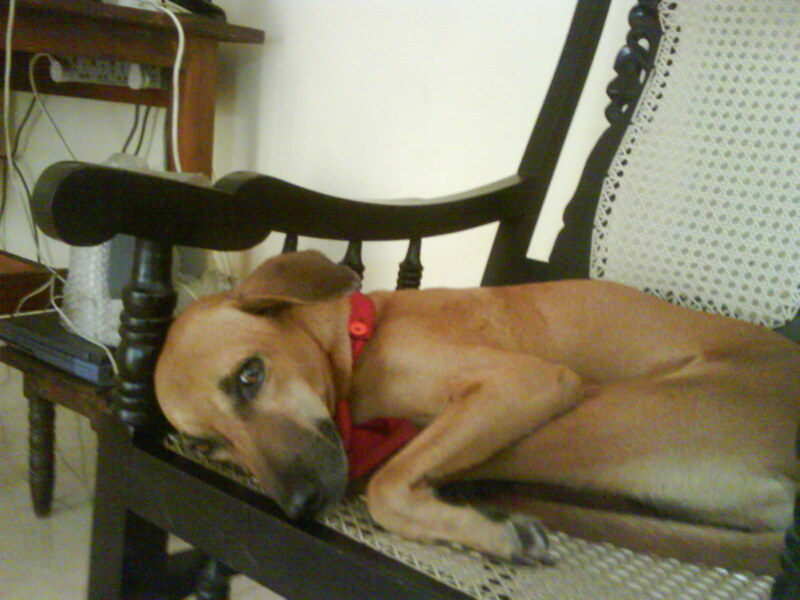 Mine used to sleep in the balcony, then moved into the living room during a rainy season and then due to her peeing under the stairway in the early mornings I had her sleeping in my room. That means that I’m often woken up at 3.30 in the morning where I have to stumble downstairs in a semi-conscious state and open the door for her. The usual way it happens is that after dinner or around the time everyone goes to bed or when I’m done using the computer (which *sigh* is still not in my room) I go up to my bedroom to sleep and call Dog-a-doodle (my new roommate) along, who would get up from her chair where she usually sleeps after dinner and move to my rug. On cold days I cover her with an old shirt and tuck her in. Now she just goes up to my bedroom on her own and goes to sleep, before me mind you, when I’m right here, all alone downstairs. I mean she is the dog of the house. That’s just not right, right? Okay I just went up to check, and sure enough, there she was all snuggled up and fast asleep on my fluffy rug. I switch the light on and she opens her eyes lazily and gives me a “Can you not make too much noise, I’m trying to sleep” look. Me! I did the only thing I could think of; I tucked her in with the old shirt, switched off the light and came downstairs. It is after all a cold night. or my rug 😛 it’s our fault really for giving her princess treatment. Sounds only too familiar. And isn’t it wonderful! Our dogs have become more sensible than we have. They know when it’s time to call it a night. And yep, I’m up at about 3:30 to let Molly out most nights. Hey Quidmont, watch the Simon’s Cat videos on utube (if you haven’t already that is). Very nicely done. That’s too funny. No I had not seen the Simon’s Cat videos but I checked some out. I especially liked the live action time-laps of what the cat does all night. Very sweet of you to tuck her in before going back down stairs. Maybe you need a motion sensor light. she’s so lucky to have you. I’m glad. cute! I guess we can no longer expect city dogs to guard the house? My dog snores loudly through the night! omg, my dog does that too!